This tour is focused mainly on the richest habitat in the American continent, the Pantanal - the World’s largest wetland - which is one of the most immense, pristine and biologically rich environments on the planet. Its flora and fauna are extraordinarily diverse and include some highly sought-after mammal and bird species. 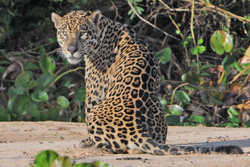 Top of the list is the magnificent Jaguar, who’s stronghold in the Neotropics is the Pantanal. 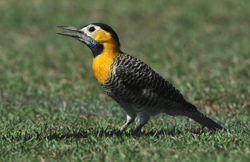 From our base on the Cuiaba River we have the opportunity of getting great views and images of this superb beast. Other mammals that we will wish to photograph, include Giant River Otter, Giant Anteater, Tapir and Crab-eating Fox. However, we must not forget the diverse avifauna present, which includes Hyacinth Macaw, Red-legged Seriema, Jabiru, Chestnut-bellied Guan, Blue-crowned Trogon, Crimson-crested Woodpecker, Green, Amazon, Ringed & Pygmy Kingfishers, Pied Lapwing, Chestnut-eared Aracari, Southern Screamer, Purple-throated Euphonia, Orange-backed Troupial and Sunbittern and an array of others – many of which are very approachable. We’ll stay at lodges/estancias (ranches) that will allow marvellous access to wildlife areas. We’ll have several river cruises, maximising our opportunities of seeing and photographing Jaguar as well as a multitude of other species. This photographic tour offers a more relaxed and flexible itinerary than the normal birdwatching tour and is suitable for both beginners and more experienced photographers. The tour is accompanied by Ray Tipper (ARPS) – a very experienced professional wildlife photographer. Day 1: Overnight Flight from UK to Sao Paulo, Brazil, followed by a Domestic Flight to Cuiabá. Days 2-3: After arrival in Cuiabá on the morning of Day 2, we will drive slowly to km 32 of the Transpantaneira Road, stopping whenever photographic opportunities present themselves. On day 3 we’ll spend a full day around Pouso Alegre. In the dry habitat there are good chances to find foxes, anteaters, and coatis. 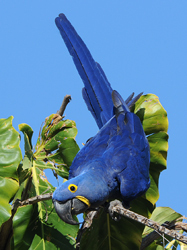 This is also a great spot for Hyacinth Macaws along with many other bird species. 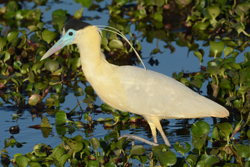 Days 4-6: On Day 4 we transfer to the Cuiaba River and Porto Jofre for 3 Nights, an excellent hotel with marvellous grounds that attract a good variety of birds particularly around its lake shore. On days 5 & 6 we’ll take boat trips on the Cuiabá River looking for Jaguars, Tapirs, Giant River Otters, Skimmers, 5 kingfisher species, Anhingas, Jabirus and a number of heron species. Day 7-8: On Day 7 we transfer to Posada Piuval. 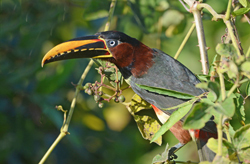 The Lodge’s grounds have a bounty of birdlife- hummingbirds, antbirds, tyrant flycatchers and tanagers. A boat trip on the lodge’s lagoon will produce a superb collection of wetland Neotropical birds as well as scrub and forest species. Day 9: Today we leave the Pantanal, but still have some opportunities for photography, before returning to Cuiabá for a flight to Sao Paulo and an overnight stay. Days 10-11: We catch our return flight from Sao Paulo to UK where we arrive on Day 11. Includes: Economy class scheduled flights (UK-Cuiabá-UK), domestic flights, en-suite accommodation based on twin occupancy, all meals, ground transportation in Brazil, entrance fees to reserves and services of leader.